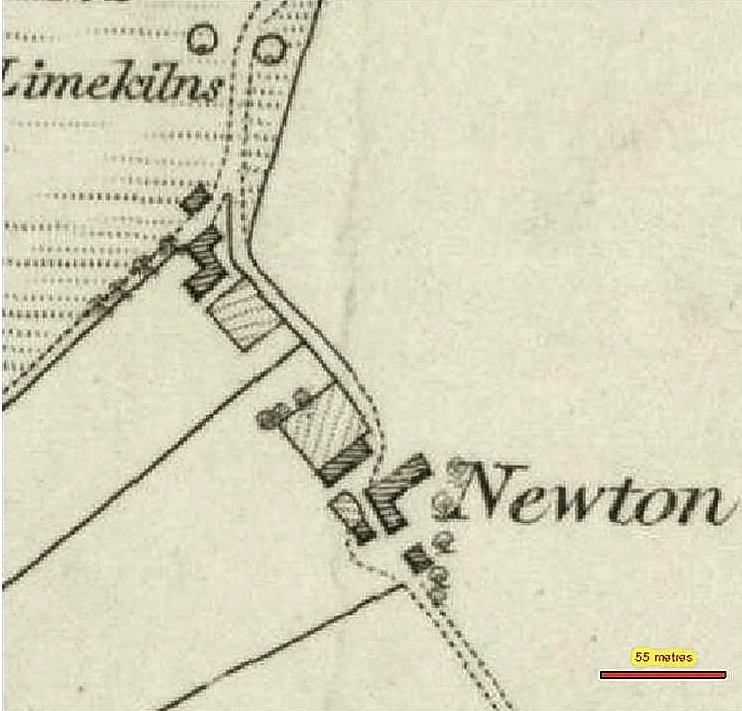 The newton is a farm steading that used to straddle the road between Eastburn and Kirkton. The original Newton Croft can be seen by clicking this link. Since then the main farm house has been separated from the steading and enlarged and modernised but still called Newton . The steading has been converted into a separate cottage called Balindore. Another steading and bothy (at the Y juction on the road) has been converted into a cottage on the south side of the road from Eastburn which has not been built at the time of this map. Aged 63 and a Farmer of 15 acres employing 1 Labourer. Cause of his death was Syneope - Old Age. Aged 79 and a crofter married to Ann Mcrobbie. Reported by Ann Reid Widow. The cause of her death was Chronic Rheumatism - 3 years - Old Age. Marriage Notes: John aged 50 and a ? Farmers Factor (unclear) of Newton Glenbucket. Ann aged 36 and at home at Rhintaing Glenbucket. Aged 29 and a Farmers Son employed on farm. Aged 59 a farmer and head of Household. Isabella next married John H Stewart. Census, 1881, Newton, Glenbucket, Aberdeen. Aged 6 and a Scholar. The Callum family moved into the newly build Eastburn when it was built in the early 1900. John Callum can bee seen in this picture of wheelwrights. The Callums are possibly included in the photo graphs of carpenters found elsewhere in the site. Search on 'Carpenters'for more details and pictures. Callam – [August] 11 - Margaret Mckenzie in Belnaboth Spouse to Charles Fraser had a child before she was married to him and gave up as the father thereof Pat Callam a young man in Newton but he denied both the woman & child the child was Baptised and Called Jean. John Thain in Parish of Strathdon stood sponcer to the child. Born in Glenbucket on 26 Feb 1824 to Harry McRobbie and Isabella Glennie. Alexander married Margaret Spence and had a child. Position: Soil Survey of Scotland 1967 to 2005, latterly as Head of Soil Survey and Land Evaluation within Macaulay Research and Consultancy Services; currently Treasurer to International Union of Soil Sciences. My initial studies in soil science commenced as an undergraduate in the Department of Soil Science at Aberdeen University in 1963. Prior to that I had spent many happy vacations on Newton Farm in Glenbuchat(40 miles due west of Aberdeen) and one summer in 1960(or thereabouts!!!) had been sent by the local farmer to investigate the activities of two persons digging soil pits and recording vegetation on Tom na Gabhar hill. It transpired they were Eric Birse and colleague from the Macaulay Institute. I reported back that their activities appeared harmless but fascinating. perhaps the seeds had been sown for my future career.